This entry was posted in Indian Politics, Indian Society, Resistance and Dissent and tagged acche din, agricultural landholdings India, capitalist agriculture, CSDS, Do Bigha Zamin, farmer indebtedness, Farmers Bills in Parliament, farmers' suicides, India's agricultural crisis, Indian farming, Indian village, Kisan Sabha, Minimum Support Price, National Crime Records Bureau, State of Indian Farmers Report, Sunderlal Bahuguna, Swaminathan Commission, water crisis in India by Vinay Lal. Bookmark the permalink. A very moving account. I suspect that the urban/farm divide is true for many countries as well outside of India. China for example, even the US. If we are removed from our rural sources of food/agricultural sustainability then our minds & souls are also dislocated and severed from reality. You’re absolutely right, Russell. I have in fact thought thinking about doing a follow-up piece largely on the state of US agriculture and the near evisceration of the family farm in some parts of the country. The most eloquent writer on the subject is Wendell Berry. There is the question of the rural / urban divide; there is also the old Marxist contempt for the countryside. There is furthermore the problem that we don’t characteristically know where the food on our table is from, and that the relationship between the food, the soul, and the body cannot at all be understood mechanistically. I was thinking of Wendell Berry too. It is a chancy occupation, farming, on any scale except corporate. I have long wondered where the farm families go after the farm is lost or sold here in the US, or India, and the eventual results of the transition a generation or so later. It would be wonderful to see a column from you on that subject. Someone such as P. Sainath is likely in a better position to answer your question, which is very pertinent, about what transpires in the lives of farm families in India after a farmer commits suicide or the farm is lost on account of unpaid loans. I haven’t actually seen much literature on this subject and it would require a persistence on the part of social workers to track a family over some years. Some of these problems of course are traceable in part to the ongoing deleterious effects of the “Green Revolution” in India (while some of the short-term effects might be characterized as ‘positive’ according to conventional economics criteria, a political economy picture is rather different), a critical literature on which has taken some time to make its presence felt in the social science literature. Hi Patrick, I accidentally posted a new comment rather than hitting reply to you. You will see my brief remarks below yours. You’re of course right about the deleterious effects of the ‘Green Revolution’ and how that has contributed to the misery of the farmers in the long run. There is, fore example, a large literature on how the soil has been adversely impacted in the Punjab. My intention, needless to say, was not to give an exhaustive account, indeed I’m only touching the surface. But I also wanted to highlight some points that are usually lost in the left critique which focuses on capitalist intensification of agriculture and has little patience for the village, and similarly has little to say about the necessity of reigniting the urban-rural links. Vinay, Incisive, helpful stuff, as usual. I would agree to some extent with your observations (after Vijay P.) regarding the attenuated form of the urban/rural divide in Kerala. There are a great many considerations here, among them the fact that ‘village’ never quite left the ‘cities’ anywhere in India in some respects–the slum, too, is part of the city, and one reason that the slum evokes distaste among the middle and upper classes is that it is reminiscent of the village, not just with respect to poverty (which is more obvious) but with respect to lifestyle and sensibility. Th links between the rural and the urban that have to be reignited refer to the idea of the village that the the city folks have disavowed. Then, to take something very different into consideration, recall also that land reform in Kerala was much more extensive than anywhere else in India, and certainly far more so than in what was until recently the other great CPM-ruled state, West Bengal. So the situation on the ground in Kerala is quite different. But I think it is true that the intellectual class in Kerala is scattered around the state and the countryside to a greater degree than in other parts of India, and of course neither Kochi nor Trivandrum hold the same place in the life of the Kerala intellectual that Kolkata does in the life of intellectuals in West Bengal. I did see previously the piece by Ashis Kothari and I have looked up your post. A very sobering and accurate account. The evisceration of any idea of social solidarity whatsoever is stunning in this regard. It is happening all over the world. Though, in my view, in the Indian context this is part of what has been called the afterlife of caste. This ancient system of power still persists and gives a certain strength to the worldwide notion that inequality and a lowly position of the very people who do the most important work in society is only natural. This can be seen in the absolutely vulgar and disrespectful way in which janitorial and service workers are treated in this country. Even still, the degree of the spread of a certain capitalistic and Americanized brand of individualism and selfishness today is remarkable and unprecedented. Thanks for your thoughtful remarks. It is important to underscore the phrase “in part” in your comments about how caste contributes in India to the “evisceration of any idea of social solidarity” and the widespread disrespect, as you point out, with which janitorial and service workers are treated. The problem extends beyond India, of course, and to countries where “caste” is not a consideration: I see that in the contempt, which may not always be palpable but is present in the very structures of renumeration, with which manual workers are treated in the US. The idea of ‘education’ has something to do with it as well, since education from at least the 18th century onwards has effected a split between work with the mind and work with the hands and created hierarchies. I am now “working” on a lecture on what we mean by “work” and why a certain conception of work has monopolized our imagination. Yes, I would certainly agree with that analysis, of course. And much research has shown that even the cultural structures in the US which ostensibly exist to help these workers, such as tipping, often do more to harm them by making their source of income variable and unreliable. I think one illustration of the impact of caste in the Indian context, or varna or whatever term you wish to use, is that teenagers and adolescents from middle and even some upper class families in the United States often take up these jobs, particularly retail cashiers, to earn money or help themselves pay for college, for instance, whereas I do not see this happening at all in educated middle class Indian families. In fact, one has the impression that the sensibilities of these families would not allow this at all. While this discussion has drawn us away from the plight for farmers, I cannot help but think that this cultural institution has relevance in the justification of the inequality now fostered by global capitalism. Great peice. 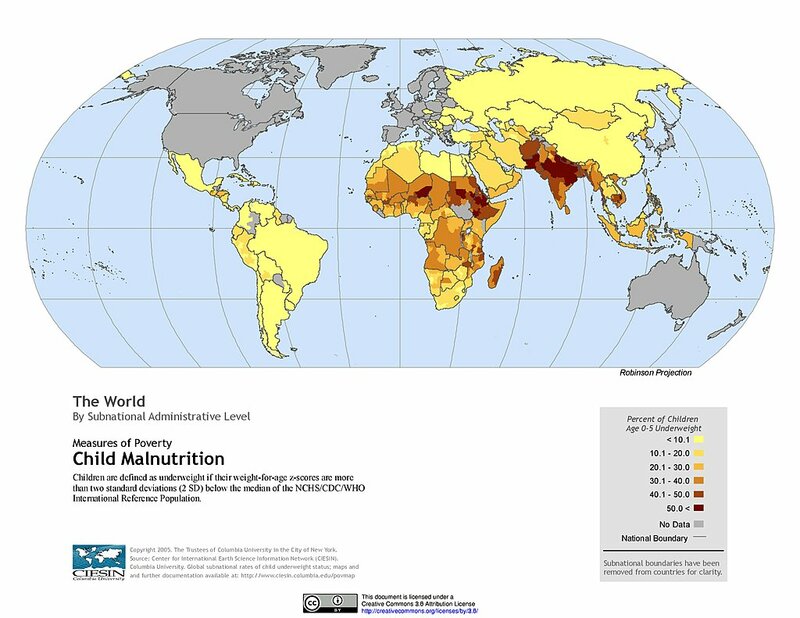 On the topic of relationship with the status of farmers in the United States, this map below of global child malnutrition was brought to my mind. On first glance one notices that the Indian subcontinent fares much worse on malnutrition than sub saharan african nations and that it is truly a national shame that the Indian government has not dealt with this crisis of child malnutrition like the public health emergency that it is even as some Indians have become obscenely wealthy. Truly provokes the question of what the point of democracy even is if India has no interest in feeding her poor but chooses to invest in nuclear weapons. On second glance, though, one notices that there is not even any data collected on the first world. Whether on farmer distress, women’s disempowerment or malnutrition, a neocolonial attitude wherein the first world gauges the third world but not itself is observed. Hello Rajeev, Excellent point, in that it is the privilege of the ‘first world’ to observe the ‘third world’. The UN recently sent a Special Rapporteur on global poverty to the US and his presence in the US was greatly resented by all American politicians, who argued not merely that there is comparatively little poverty in the US but that the UN has no business overseeing countries such as the US. I would go so far as to say that we need international monitors for most things in the US, from poverty, election fraud, and voter suppression to outright racism and suppression of reproductive rights of women. Theorists of a previous generation spoke about the ‘gaze’, who observes who and with what right.